Low-cost whole-cell biosensors for environmental and medical surveillance. With an increasing human population and global industrialisation, we are jeopardising environmental security for the sake of economic growth. Behind rapid urban-industrialisation and technological revolution, human activities have discharged tremendous amounts of industrial waste and pollutants that not only degrade environmental quality, but also put the world on course for a catastrophic and irreversible climate change, as reported recently by the Intergovernmental Panel on Climate Change (IPCC) (1). Thus, to achieve environmentally friendly and sustainable development, constant monitoring and analysis of environmental quality data including soil, water and air are paramount. However, there are huge insufficiencies in how we currently assess environmental quality: indicators used in measuring indoor-air and urban air quality are limited, with only a few initiatives available to measure the dose-response at local level; data collection for water quality at regional level are extremely challenging due to remoteness; large-scale measurement of land and soil degradation are inadequate due to technical problems (2). The challenge of environmental monitoring is worsen in developing countries, where infrastructure, accessibility and scientific capacity are extremely limited. Recent advances in sensor technologies have been powered by low-cost and high performing electronics. Nevertheless, there are some critical bottlenecks in current environmental sensors: commercially-available sensors are mostly limited to temperature, humidity, particulate matter (PM), and carbon dioxide sensing, in which molecular detection is hardly possible. For thorough and detailed detection at a molecular level, environmental samples need to be packaged, maintained, delivered, and processed before the analysis can take place in an equipped laboratory setting by a skilled technician. This indicates a huge gap in the current environmental monitoring systems. To this end, we have created a low-cost sensing device which is portable, easy-to-use and is capable of detecting pollutants with high selectivity in real-time. With above in mind, we have produced a minimum viable product (MVP) for proof-of-concept purposes. 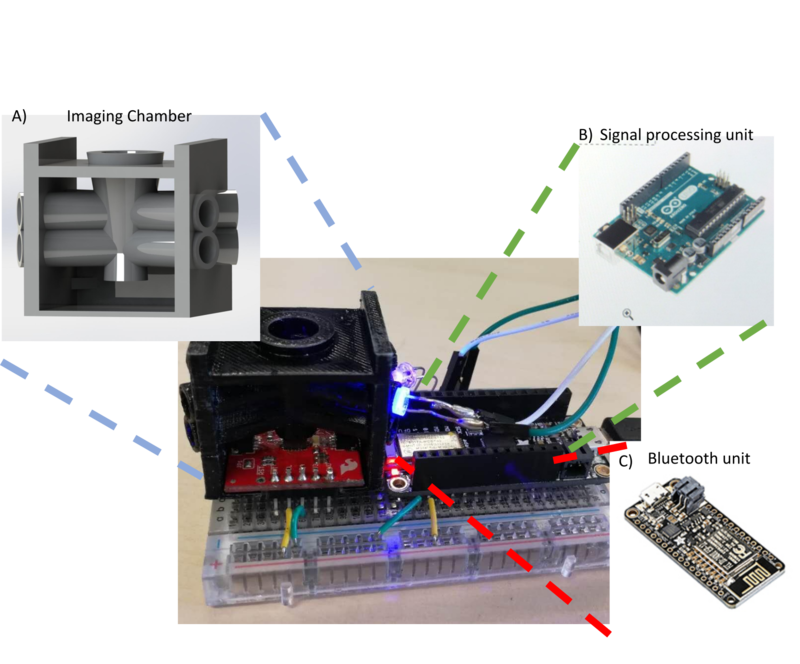 By using a low-cost fluorometer, signal processing unit and 3D-printed imaging chambers, we can detect green fluorescent protein signal with appreciable gains. The measuring capability of our MVP is comparable to a high-end plate reader, which is traditionally used for a similar purpose but only under controlled laboratory environment. Thanks to Jack Xiaoyu chen, Feng Geng, Jimmy Chen, Boon Lim, and Tony Naggs.